So, xen is really beginning to piss me off. I turned off all my machines to do a snapshot, and when I tried to bring them back up, they were all in the ‘blocked’ state. Upon further investigation (using virt-manager/xm console), I found that they were hung at the “Checking for hardware changes” item in their boot process. This could be a CentOS/RHEL 5 issue, but I’m putting my money on xen. 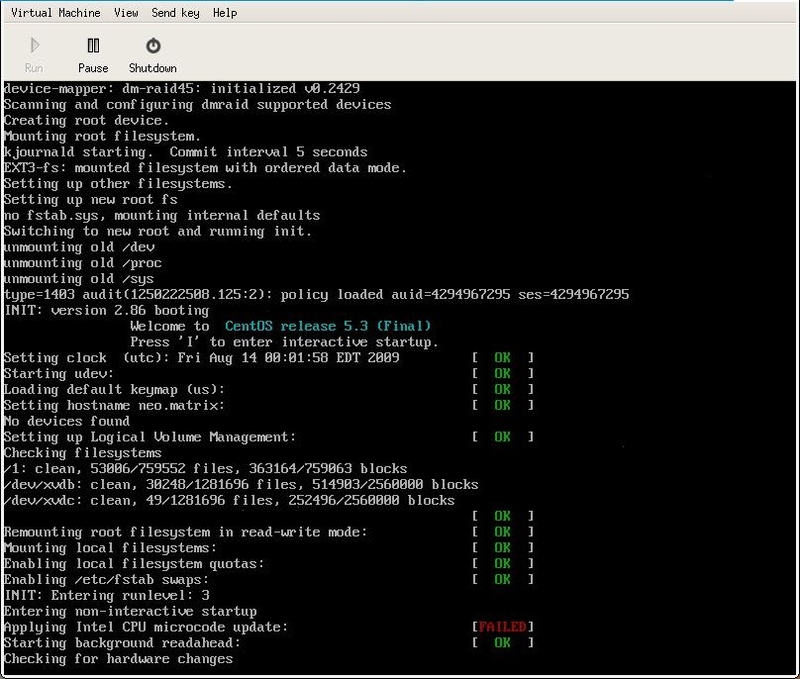 Note: This effectively prevents kudzu (the RHEL mechanism to detect hardware changes) from starting on boot. Beware that this is probably a terrible idea; I have no idea what the implications of preforming these actions will have on your system. I *do* know, however, that it got my machine to boot! [root@dom0 /]# ls /dev/mapper # no more loop devices! There are more “proper” (less destructive) ways to do this. From your screen shot above, we see that the problem only occurs when entering run level 3 and it hangs at the change detection (kudzu) line. So, the simplest thing to do is configure kudzu so that it does not start in level 3… which will at least get you past that hang point. 2) Disable the kudzu level 3 launcher by renaming the launch file from capital S to lower case s. This disables the service but leaves all the files and data intact in case you want to turn it back on quickly. Do this by issuing the command: mv /etc/rc3.d/S05kudzu /etc/rc3.d/s05kudzu (again, notice the “s” before “05” has changed case). If you’re using this VM as a server, and the hardware isn’t going to change drastically any time soon, you’ll probably want to leave kudzu disabled anyways. Thanks for your input. I’ll probably do something like that in the future. …to the xen config file (in this case: /etc/xen/guest) in order to get into single user mode on a DomU. From there, you should be able to pick back up on #5 in your instructions. An alternate solution would be to press ‘I’, when it says you can, and select ‘N’ when it asks if you want to start kudzu. This is a year late, but when I’ve had this happen, its usually that the xenconsoled in the dom0 has died. Restart it and all should be good.